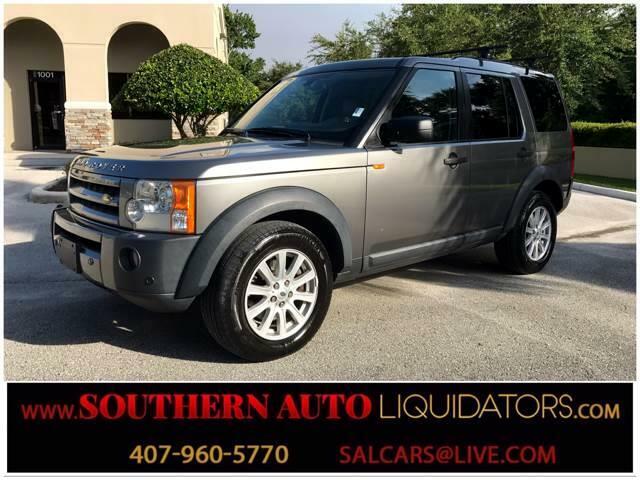 www.southernautoliquidators.comPhone: 407-960-5770Land Rovers have become the go-to vehicle the world over for adventures taken off the safe confines of pavement. The 2008 Land Rover LR3 embodies this legacy and adds the luxury niceties expected by today's SUV buyers. These consumers aren't looking at the LR3 as a means of taking on off-road extremes but as everyday family transportation. In that regard, the LR3 delivers with standard seven-passenger capacity and three spacious seating rows arranged in 'stadium' format to give its occupants a clear view of whatever lies ahead. The standard dual sunroofs also give them a clear view of whatever lies above. For those in frequent need of big-time stuff-hauling capacity, the LR3's high roof and fold-absolutely-flat rear seats provide a tremendously useful cargo area. As a luxury vehicle, the LR3 provides the sort of features we expect from this competitive segment. And it offers an unparalleled rugged image and serious off-road capabilities to back it up. If dirt roads, rutted trails and all-terrain adventures are frequent destinations for your family, it's hard to think of an SUV better-suited for the task than the Land Rover LR3. This Rover comes fully equipped with navigation, parking sensors, panoramic sunroof, 3 rows of seats, roof racks, power everything. This car is in amazing condition. Call to schedule an appointment for a test drive, today!Southern Auto Liquidators1255 Belle Ave. Unit 131Winter Springs, FL 32708Phone: 407-960-5770Get a well-maintained, competitively priced, Used Car in Winter Springs at Southern Auto Liquidators. We hand select our Used Vehicle Inventory, to offer unsurpassed quality and value.GIVE US A CALL TODAY FOR YOUR PERSONAL APPOINTMENT... 407-960-5770.You will never pay dealer fees at Southern Auto Liquidators. We believe in giving you the highest quality vehicle for the lowest possible price. Give us a call or text, and we will be happy to calculate your total out-the-door cost. We Accept VISA, MasterCard, CASH, Debit Card . NEED FINANCING, WE CAN HELP, FINANCING IS AVAILABLE... GREAT RATES!!! We can also work with your bank or credit union, please visit your bank or credit union for financing information if you prefer to go through them. Message: Thought you might be interested in this 2008 Land Rover LR3.